When it comes to learning experiences for your child or children, there’s no reason for information to begin and end with the classroom. Opportunities to expand your child’s desire to learn and engage with information exist in your everyday activities – from cooking to Saturday sports. 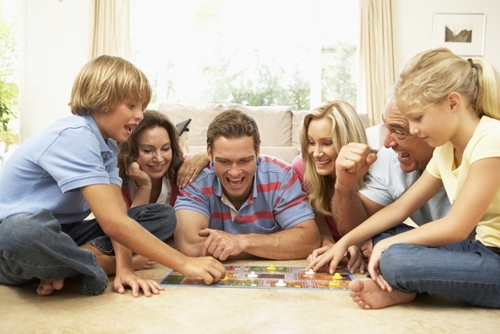 Board games are one of the most time-honoured ways to spend evenings as a family – and for good reason. Board games can help your child develop reasoning skills, tactical skills and other problem solving tools. In order to gain the greatest benefit from time spent playing board games, try to introduce a game which will continually challenge and test your child. Games with buildable or modular content are particularly great for this, and will ensure that your child doesn’t become quickly bored or restless with the routine. Another way to encourage and develop your child’s passion for learning is to provide them with an environment of like-minded children, such as a program designed for encouraging talented or gifted education. These programs give children an opportunity to discuss and explore their ideas in an open, non judgemental environment, where there are other children who share their passion for learning and new ideas. Cooking provides an excellent opportunity for you to help teach your child about how to balance seemingly disparate elements, while also encouraging their creativity. Depending on the age of your child, you may be able to set an evening or afternoon each week aside where they are given full responsibility for cooking the household meals. A task like this can encourage your child to plan (resource plan, task plan) and to actively problem-solve. If your child is younger or not quite ready for such a task, it might be more ideal to provide them with an appropriate cookbook and attempt to guide them through the process. Involving your child in everyday household decisions and processes can also help them to understand the challenges involved in maintaining a family and a home, while also giving them a sense of personal responsibility. Some everyday decisions and tasks in which you can encourage the input of your child include: home maintenance, decoration, gardening and budgeting. Each of these will require a different set of skills from your child (for example, budgeting will require some maths and problem solving skills, while decoration will encourage their artistic and creative skills). Travel is an excellent way to teach your children about life outside of their own small community. Travel can provide your child and your family a good opportunity to discuss larger issues as you see them, and to provide context to their understanding of the planet. Travel can be as short and uncomplicated as a camping trip or weekend away, or as complex as an overseas vacation. New experiences, new cultures and new locations all present wonderful opportunities to undertake a learning journey. Team sports are not only a great way to ensure your child is active and healthy, they also provide an extra opportunity to learn transferable skills such as goal-setting, team building and tactical approaches. Try providing your child with a selection of different team sports and see which one (or multiple) they are most drawn towards. Some children will thrive on the fast pace of sports such as hockey or basketball. Other children may prefer the pace and tactical approach of a longer form game like cricket or baseball. If your child is new to a sport be sure to do your research to make sure they are wearing the right size gear. You can do this by looking at a baseball bat buying guide or a hockey stick sizing chart, for example. Learning devices and electronic/haptic technologies can also provide you with a convenient, take-anywhere way to keep your children moving forward in their learning journeys. Devices such as iPads and tablets are able to be filled with apps designed to augment the school learning processes, and to expedite knowledge in core learning areas (numeracy, literacy, comprehension). Use of these devices at home can help to build confidence in your child, while also providing a fun and portable way for them to learn. Creating spaces and opportunities for your child to learn is not as complex as you might imagine. Simple strategies such as involving your child in everyday household processes, and encouraging the uptake of games and sports can help to trigger and nurture a lifelong love of learning.